Genesis 1:3 tells us that God spoke light into existence. He spoke into a highly excited field of chaotic energy that He had vibrated, which created a state of kinetic energy and pressure waves that produced the plasma that Moses called water. The plasma is important because without its presence, science will argue that the observable laws of physics do not allow sound waves to propagate through a vacuum – or a void. But physics also tells us that sound waves do propagate through plasma. And it is important to understand that sound and light exist in the form of waves with similar and different characteristics. Cosmologists do not usually think in terms of sound, but this aural picture is a good way to think about the Universe’s beginnings, says astronomer Mark Whittle of the University of Virginia in Charlottesville. Whittle has reconstructed the cosmic cacophony from data teased out over the past couple of years from the high-resolution mapping by NASA’s WMAP spacecraft of the cosmic microwave background radiation, the afterglow of the hot early Universe. The variations in the cosmic background radiation expose the relative clumpiness of the early cosmos at a variety of different scales. These density variations began as quantum fluctuations in the moments after the big bang, and then propagated out as sonic waves. The denser regions became the seeds of galaxies and stars, which is why astronomers are so interested in them. While at this point, Whittle’s theory is not the standard in Cosmogony, it is a partial confirmation of the Creation Account sequence in Genesis. It errs in placing the Big Bang before the quantum fluctuations and the propagation of sonic (sound) waves but it does recognize the importance of sound waves in the early universe and acknowledges their existence. However, Whittle is not the first to recognize that sound waves played an important role in the early universe. NASA also came to this conclusion. Below is NASA’s map of the sound wave that propagated through the early universe. 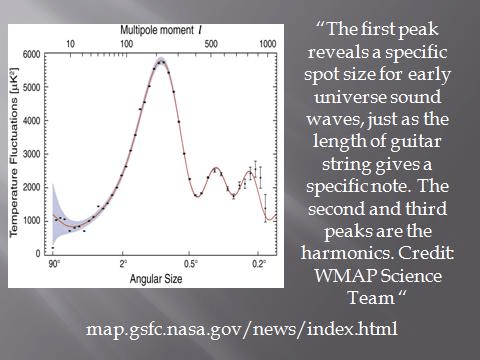 Note that NASA also acknowledges that the peaks indicate that harmonics were present. This will become important as we move forward. In the act of speaking, God first sent acoustical waves through the primordial plasma field, and the waves provided the environment that organized some of the energy into light, which developed polarization and would enable the formation of charges and eventually matter. This is the point of transition. It is where a wave propagates through a field of highly excited energy, and in the process, some of the energy is polarized by the current of the wave and particles come into existence. Normally sound waves are longitudinal waves that do not exhibit polarization but these waves were highly pressurized and did not exist in an equalized medium. Additionally, we know that at the surfaces of liquids, vibration (or sound waves) can also travel as transverse waves, where the compression is at right angles to the direction of motion. Remember, God hovered over the “face” of the waters, indicating there was a surface to the void. At this point God had not stretched the creation out and the Big Bang’s expansion had not occurred, so there was plenty of surface for the pressure waves to work on the plasma. Science also tells us that sound waves are generated by a sound source that created vibrations that propagate away from the source in the form of a wave. The Genesis account tells us that there was intense vibration at the time God spoke. In other words, He (the source) created sound waves that propagated through intensely vibrating plasma away from Him (the source), which most likely oscillated the sound waves, since the plasma did not have constant physical properties at this point in time. This type of environment is capable of producing the type of sound wave that emits light and is polarized, discussed below. The NASA map above clearly shows that the sound waves produced primordially were harmonic in nature. This is also evidence that the waves were capable of traveling transversely – or at different angles. In transverse waves, mixed tones can be produced in the form of harmonics. It should also be noted that the amplitude of the sound also affects the creation of harmonicsiii. Modern experiments have shown that propagating sound waves through a liquid emits light in what is called sonar luminescence or sonoluminescenceiv. As the sound waves travel through an unstable liquid – such as highly ionized plasma – extremely hot bubbles form that burst and emit light. This happens as the waves excite the energy by ultrasonic irradiation, which form multiple bubbles that emit bright flashes of light when they collapse. These bubbles are so hot that they can literally melt steel. Another interesting meaning for the word “Yom” that is translated as “day” in Hebrew, is “to be hot” – another strange co-incidence where the Genesis account of Creation is supported by modern day physics. It should also be noted that the mechanical qualities of these primordial sound waves created current through the plasma, which gave way to electromagnetism. This characteristic enabled the extant chaos to be organized through polarization, first as light and later as matter. While Genesis 1:3 is not the creation of matter, it is the first explanation for the creation of turning a virtual particle into a particle that is disbursed throughout the light cone (an interesting phenomenon and worthy of study). At this point we have a sequence: first there was a void; then God hovered over the void and created kinetic energy, through which He brought water/plasma (all of which can be verified through modern experiments); after which He spoke into the plasma, which sent mechanical acoustical (oscillating) waves through the environment capable of producing radiation and electromagnetic waves. These waves propagated through the plasma in a recognized phenomenon known as sono luminescence, which came into being the first time when He spoke light into existence. On Day Two (which is not being discussed herein), God then stretched the light and in so doing, created time and space as well as information. Day Two is also the point in time when God created dimension when He twisted the waves as He stretched out the creation, a crucial point that is overlooked. The stretching that is clearly documented in Genesis, as well as 17 other verses throughout the Bible, is observable today and the basis for the Big Bang Theory and is not discussed in this work but is intended to be discussed in subsequent works. What is not understood is the phenomenon that resulted as a result of the creation being stretched, such as time dilation, Doppler shifts, and the nonlocality of light. This newly created environment was the beginning of providing the plasma, the waves and the mechanisms whereby the polarized energy was organized into charges and then into matter, and which also allowed for the recording of information. Thus, it is how God brought something out of nothing. Hence, the scientific search for origins leads directly back to God. If you don’t believe in God, you are faced with a scientific dilemma. You must be able to propose a mechanism for changing quantum fluctuations into kinetic energy; and then into plasma; and then into waves without a source; and then into light; and then create the ability of these waves to create and record information without an intelligent force; and then into the matter we observe today – and all of this while violating the Second Law of Thermodynamics. It should not be any surprise to the Creationist that NASA has documented a sound wave that propagated at the beginning of the universe. And, of course in order to explain how something came out of nothing without God, you must be able to propose a mechanism for the popular Big Bang, or sudden expansion of the singularity as well as how organization developed from chaos without a defined mechanism or input of external energy. All of these questions can be answered and unusual phenomena can be understood when looking through the lens of Scripture. Like it or not, the sequence and all the sciences needed to bring the universe into being as we observe it today is detailed in the first few verses of Genesis. In conclusion, it is very important to understand that when God created, He not only brought forth the universe as we know it; He created the physical laws to accommodate His creation as well. It is why there is such a thing as physical laws that demand that somehow someway an irreversible and reliable pattern of operation exist. In a created universe that was intelligently designed, physical laws are explainable. In a random universe that came into existence haphazardly through chaos, it is possible by highly unlikely that physical laws would exist, since only randomness and chaos can come from randomness and chaos. That is not what we observe today. Therefore, Evolutionists should have the burden of answering many unanswered questions before their hypotheses should be taken seriously. ii http://en.wikipedia.org/wiki/Polarization_(waves). http://www.physicsclassroom.com/class/waves/Lesson-1/Categories-of-Waves. http://www.physicsclassroom.com/class/waves/Lesson-2/The-Anatomy-of-a-Wave. http://www2.cose.isu.edu/~hackmart/waves100.PDF. http://physics.info/light/. iii http://www.jhu.edu/signals/listen-new/listen-newindex.htm. http://en.wikipedia.org/wiki/Simple_harmonic_motion. http://www.phon.ucl.ac.uk/courses/spsci/acoustics/week1-4.pdf. http://www.dspguide.com/ch11/5.htm. This entry was posted in Origin of the universe and tagged astronomy, Bible, physics, scientific theory by RoseAnn Salanitri. Bookmark the permalink.